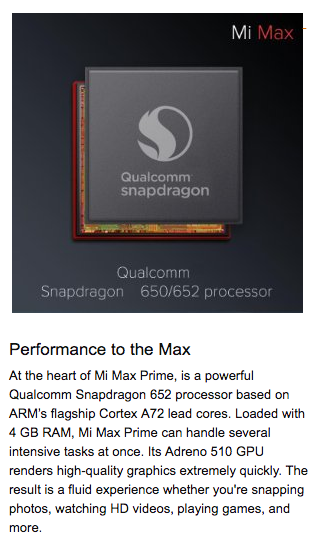 Xiaomi Mi Max Prime smartphone with 6.44-inch 1080x1920 display powered by 1.8GHz hexa-core processor alongside 4GB of RAM. We want a big screen, not a big phone. 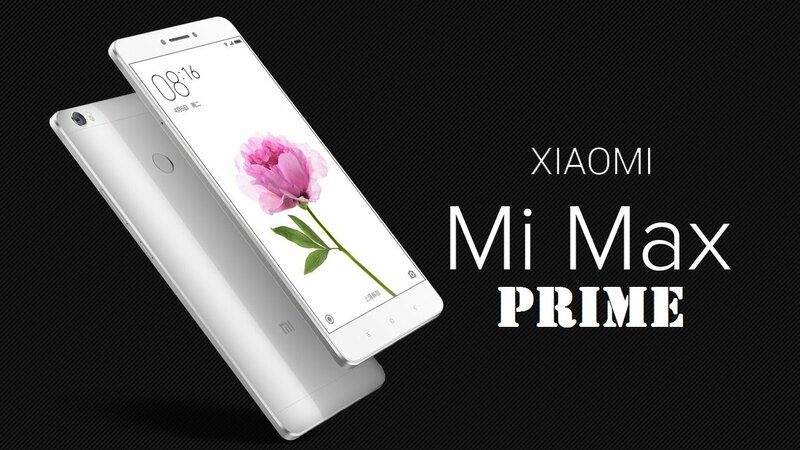 Despite its large display, Mi Max Prime is extremely light and compact. It comes with a gently sloping 2.5D glass which seamlessly merges into the metal edge giving a luxurious hand feel. The 7.5mm thin metal body richly adds to its beauty giving it an ultra premium look and feel. Indeed, Mi Max Prime can be managed with one hand and fits snugly into almost any pocket. Don't just watch movies, be a movie maker. 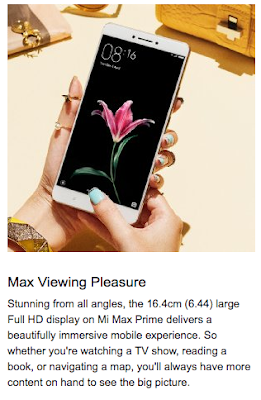 Mi Max Prime has a massive 16MP resolution camera with fast Phase Detection Autofocus (PDAF) so that you can quickly capture scenes as they happen around you. Think of the display as your 16.4cm (6.44) viewfinder for framing the right shot. It's a bigger, better shooting experience that brings videos and photos to life. Unlock Mi Max Prime in an instant with fingerprint recognition. Add additional layers of security and privacy too. Lock apps, hide folders, privatize notes and enable child mode. Access files and information securely and quickly with a single press. Fingerprint accuracy improves over time with each successful unlock. Have peace of mind knowing that you can get 4G on Mi Max Prime no matter which carrier you are on. Both SIM slots are 4G capable and support VoLTE for higher quality voice calls. The best way to bring all your music, photos, shows and movies in a single device. Mi Max Prime comes with a massive 128 GB on-board flash and can be further expanded by an additional 128GB using a microSD card. 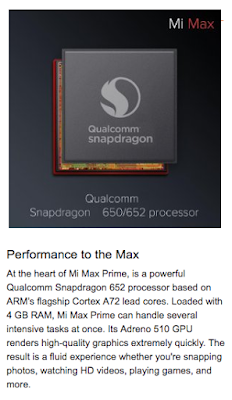 This gives you a gigantic storage capacity of 256 GB on your phone! Inspired by the swirling colors of the kaleidoscope, MIUI is beautiful, user-friendly and more efficient than ever. Take scrolling screenshots, calculate currency conversions, create dual app log-ins, or access split phone profiles. Loved by over 200 million active users worldwide, there are many new features in MIUI 8 that you can take advantage of today.